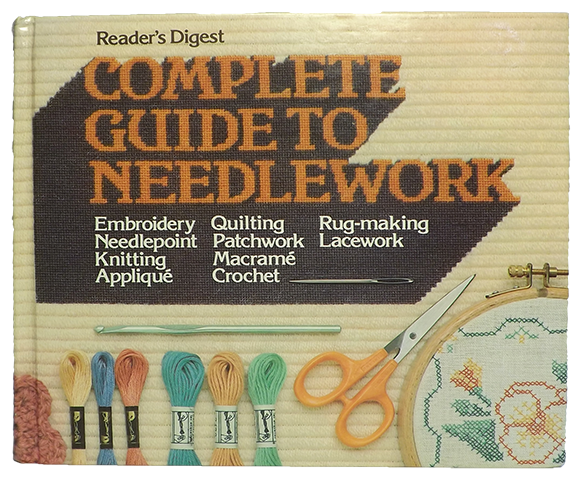 I have been playing around figuring out some of the knit stitches in my favorite needlework book: Reader's Digest Complete Guide to Needlework. I specifically like the 1979 version of this book because of the excellent hand drawn illustrations. The Network lace stitch is pretty easy and once I got the hang of it I could work on while watching TV so this scarf is the result of a combination of finding some interesting light weight yarn and keeping my hands busy. Without a plan, I just started knitting with some Suss multicolored yarn and quickly realized that I wouldn't have enough to finish the scarf, so I added the solid red Alpaca yarn. As I continued knitting, I realized that it still wouldn't be a very long scarf and I didn't want to buy any additional yarn. 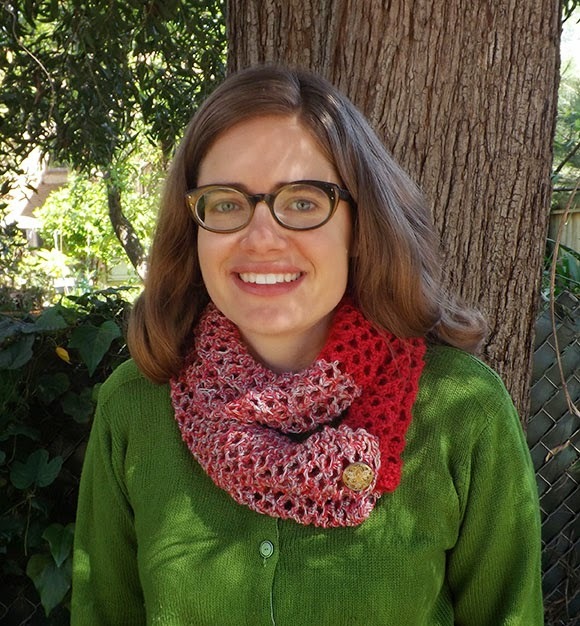 So I decided to make a loop scarf with buttons, that way there are multiple ways to wear it. 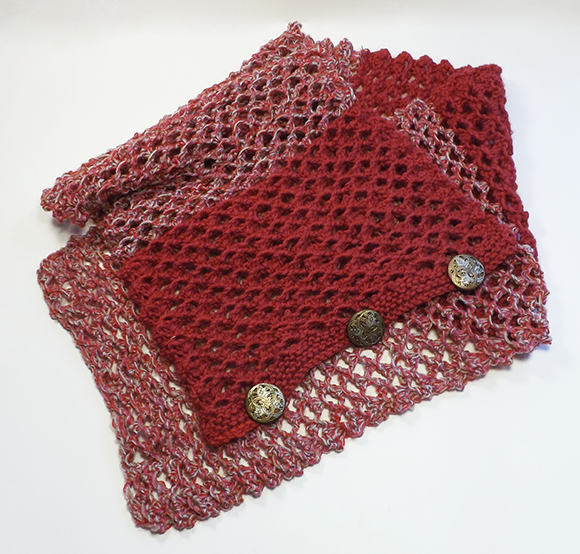 While it doesn't seem very long, the loose stitches are stretchy so that it still can be worn as a traditional scarf. 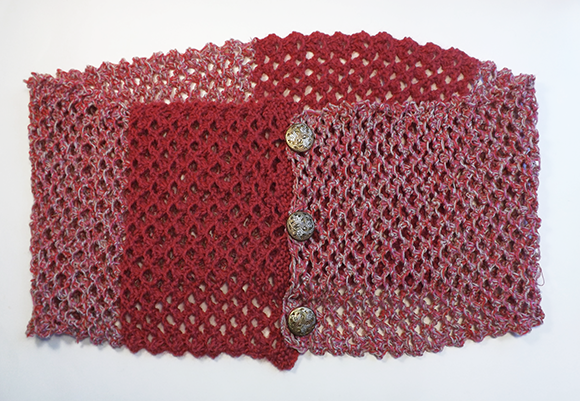 The open lace stitches create the buttonholes so you can fasten them just about anywhere along the length of the scarf. My scrap yarn projects often don't turn out well so I'm very happy to make something I'll actually wear. Plus I got to use some of the antique buttons my Aunt gave me. It's nice to cobble together a scrap project that lets you use some awesome things that have been laying around for a long time. ©2011-2019 Claire Sanders. Powered by Blogger.